There is a song by the band “The Eagles” that speaks about how "In a New York minute, everything can change.” If you have ever visited the 911 Memorial site in Manhattan you will know that it is a poignant reminder of the truth of such a statement. Last week here at Mount Hebron Presbyterian we talked about a Widow's mite. (Sermon here). This week our bible reading is from Mark 13:1-8. Jesus speaks to His disciples of how even the great temple that they were admiring would one day soon be nothing but rubble, a prophecy that came true when the Romans ransacked Jerusalem in AD70. Holding onto faith in the midst of a world that often seems to spiral out of control is a challenge for believers of any generation. But Jesus suggests a way through. Don’t be led astray. In every age there are those who seek to provide us with the answers that will save us all. Atheists suggest religion is the problem, politicians blame each other, economists blame the market, and everybody has an opinion! The challenge for anybody seeking to be a disciple of Jesus Christ is to allow His truth to be the lens through which we view all other beliefs. Don’t be alarmed. There has yet to be an age that has not been characterized by wars, rumors of wars and other such disastrous events. Such has always been the way of the world, and will continue to be so. Reformed theology relates the chaos to the inherent sinfulness of our human condition. Notice how when a crisis comes along there is always somebody to say; "Here’s yet another sign that the end is near!" Jesus strongly suggests that we need to take care interpreting signs of the times lest we reach the wrong conclusions. The amusing series of books by Douglas Adams; “The Hitchhikers Guide to the Galaxy,” offer a great perspective. Every volume is marked with the words "Don’t Panic!" Panic is not helpful. Trusting that God is in control is a better option. Do be alert. 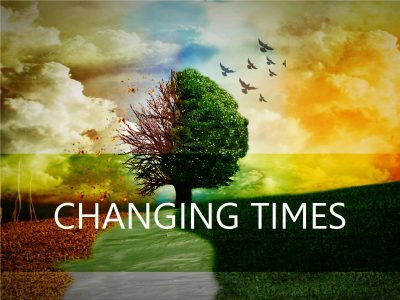 Whilst encouraged to find our peace in God, we are also cautioned to be awake to the changes that are around us. If we are going to put our faith in something, better put it in something that is tried, tested and true. The Christian gospel has proved remarkably resilient. A personal faith in Jesus Christ provides resources that cannot be found elsewhere. God’s Spirit can bring to the center of our existence a hope that transforms our worldview and helps guide us through the maze. For sure others will come suggesting they have a better way. For sure there will be wars and rumors of wars. For sure nothing stays the same. Even temples turn back to dust. In the midst of a changing world Jesus invites us to hold fast to His love! Prayer: ‘Lord let us not be led astray, let us not be alarmed. Keep us in Your love and guide us through the changing circumstances we encounter each day. Amen. The Reverend Adrian J Pratt B.D.